Island is facing an "unprecedented disaster," its governor said. 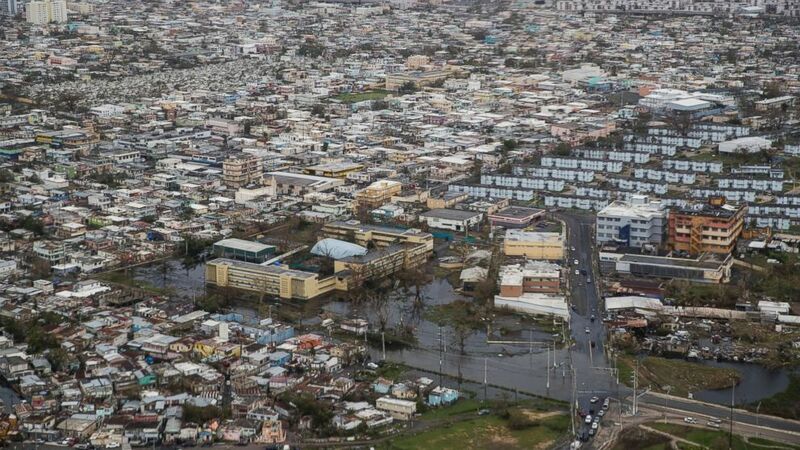 The situation is dire for the over 3 million Americans living on the U.S. territory of Puerto Rico, which was battered by Hurricane Maria last week. ABC News flew in a chopper today along the path that Maria took over Puerto Rico, showing the widespread devastation left behind, from the demolished homes to the downed power lines. Puerto Rico Gov. Ricardo Rossello says the island is facing an "unprecedented disaster" in the wake of Maria, which tore through on Sept. 20, killing at least 16 and knocking out electricity to the entire island. The storm also devastated other islands in the Caribbean, including Dominica, where at least 27 have died. "The devastation is vast," Rossello said. Maria built on the destruction caused by Hurricane Irma, which blew through just weeks earlier. 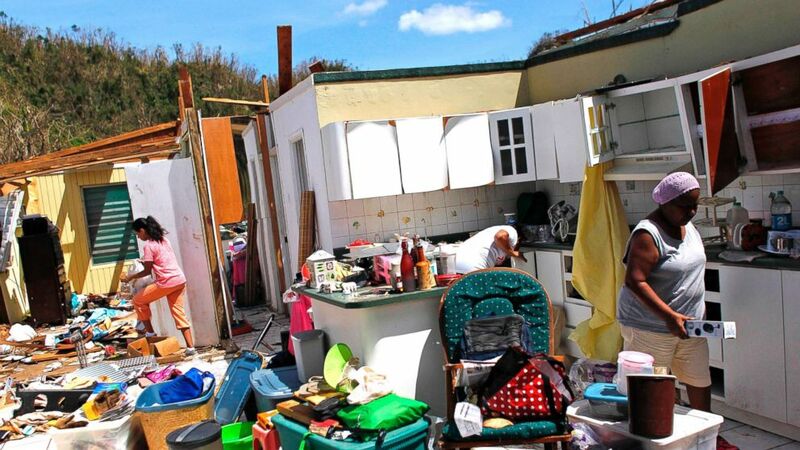 (Ricardo Arduengo/AFP via Getty Images) Family members collect their belongings after hurricane force winds destroyed their house in Toa Baja, west of San Juan, Puerto Rico, on Sept. 24, 2017. The view from the sky today of Maria's aftermath showed gas lines, often stretching for miles, especially in more remote areas where people are desperate for fuel. Rossello on Sunday called for calm and said 185 gas stations are open throughout the island. Maria demolished homes made of wood, while those built out of concrete for the most part survived. Now five days since the storm hit, the chopper ride showed that most of the widespread flooding is gone, but some neighborhoods are still underwater. The governor said today that more than 5,500 people have been rescued. The storm also flattened farms. 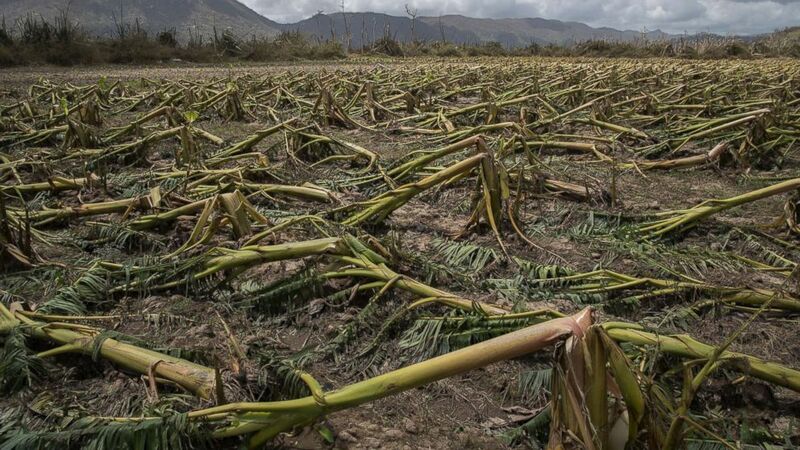 Puerto Rico's Department of Agriculture has said that 80 percent of crops could be lost. (Victor J. Blue/The New York Times via Redux) Flattened plantain trees line the ground in Yabucoa, Puerto Rico, Sept. 24, 2017. The New York Times reported that one farmer predicts, “There will be no food in Puerto Rico." (Joe Raedle/Getty Images) A flooded street is seen as people deal with the aftermath of Hurricane Maria on Sept. 25, 2017 in San Juan, Puerto Rico. The collapse of the Guajataca Dam is still imminent and engineers are reviewing the dam to get a better sense of its conditions. Maria left the entire island in the dark. Ahead of Irma, residents told ABC News how fragile the infrastructure is and how easily power can go out. 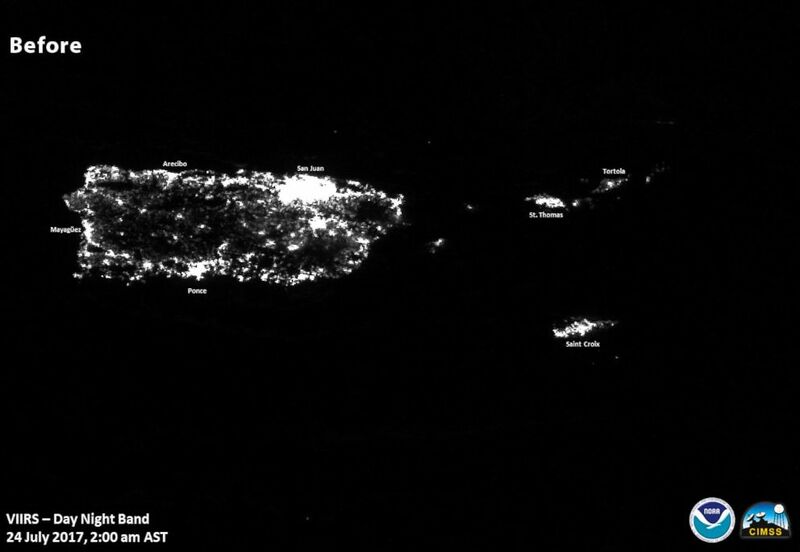 (NOAA/NASA) Images of lights on in Puerto Rico before Hurricane Maria. 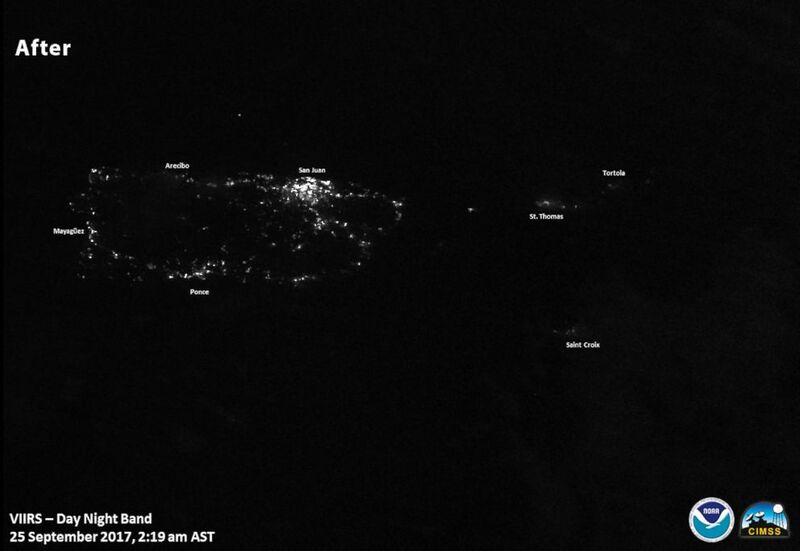 (NOAA/NASA) Images of lights on in Puerto Rico after Hurricane Maria. After Maria, the island has been reliant on generators, especially in San Juan. The island's mountainous terrain is difficult to navigate, which makes getting in to simply restore down power lines more complicated. Power restoration efforts are now underway. As of today 27 percent of the San Juan area -- the capital -- has cellphone service, and 65 percent of fixed lines can make long distance calls, the Puerto Rico Governor's Office said. Officials said 40 percent of water customers now have water. Rossello said today that 15 food supply routes using trucks have started and helicopters will be used to bring food to people in the mountains. Rossello also said cruise ships will be arriving with supplies. In a statement today Rossello said, "We will need the full support of the U.S. government." "This is a humanitarian disaster involving 3.4 million U.S. citizens," Rossello said. "People cannot forget we are U.S. citizens -- and proud of it. So much so that in the aftermath of Hurricane Irma, which also hit Puerto Rico, we conducted emergency rescue operations to save thousands of U.S. citizens in the Caribbean islands that were devastated by that storm." (Victor J. Blue/The New York Times via Redux) An aerial photo shows San Juan, Puerto Rico, days after the island was hit by Hurricane Maria, Sept. 22, 2017. 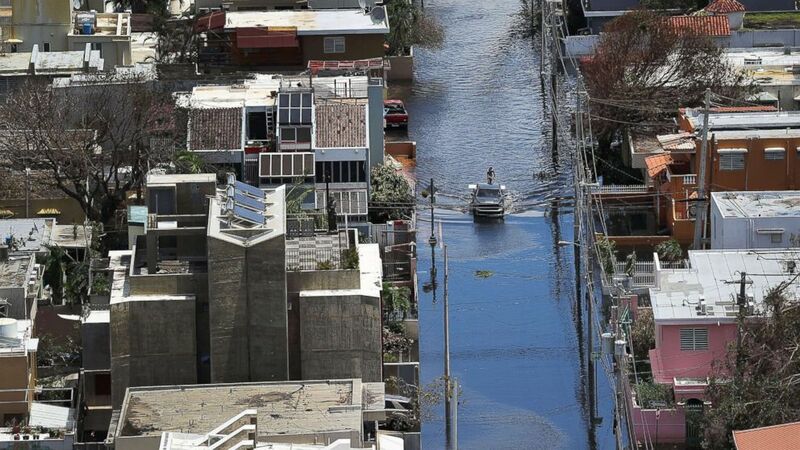 "Given Puerto Rico's fragile economic recovery prior to the storms, we ask the Trump Administration and U.S. Congress to take swift action to help Puerto Rico rebuild," Rossello said. Assistant to the president on Homeland Security Tom Bossert, who is in Puerto Rico, today called this a "very long and hard recovery" but vowed to Puerto Rico residents, "You will get what you need to recover." FEMA administrator Brock Long, who is also in Puerto Rico, echoed Bossert's sentiments, saying the power of the federal government is being used to help Puerto Rico. Long said search and rescue operations are still ongoing and more than 10,000 people are there to help clean up. He added that FEMA officials are working on evacuating people from outlying hospitals to the Centro Medico in San Juan. A total of 530 people in Puerto Rico and the U.S. Virgin Islands have been "saved or assisted" by FEMA, Coast Guard, U.S. Customs and Border Protection, and other search and rescue teams, FEMA announced today. More than 2,000 soldiers and U.S. Army Corps of Engineers civilians have responded to Maria relief operations in Puerto Rico and the U.S. Virgin Islands, according to the Army.